We're planning on being at two cons this coming weekend. We'll be at STEAM Fest on Apr. 14-15 at the Academy Theatre on 119 Center St., Avondale Estates, GA. 30002. We'll also show up briefly on Apr. 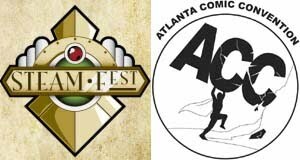 15 at the Atlanta Comic Convention at the Marriott Century Center on 2000 Century Blvd., Atlanta, GA. 30345.